Right after a three day Leafmonkey workshop "Walking with Nature at SOTA", some of us only had a few hours of sleep before we head out for another session with nature. 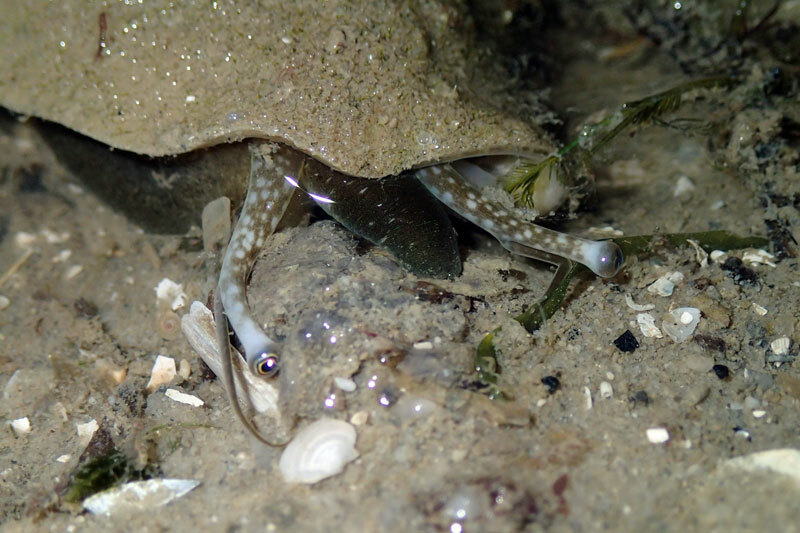 The only difference is that we do not see people, but marine animals on our intertidal shores. The location: Changi Beach. The stretch of shore we covered on this trip is full of new life. 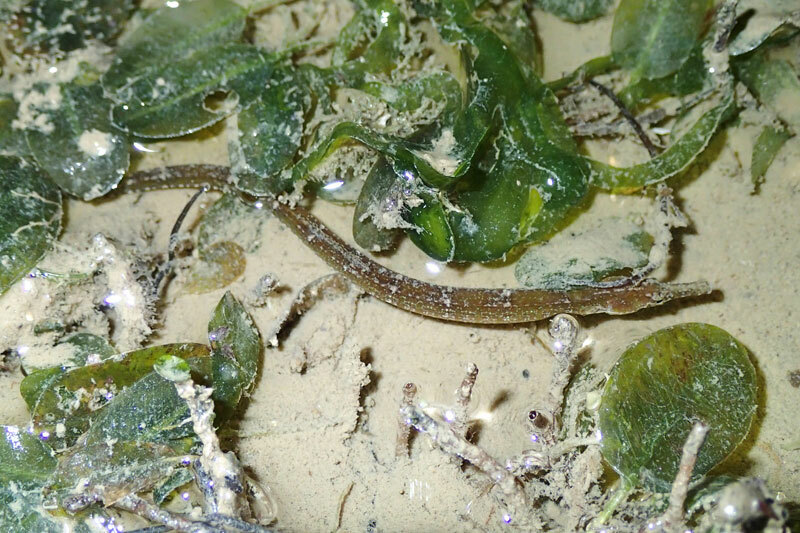 I came across so many juvenile animals such as this seagrass pipefish. 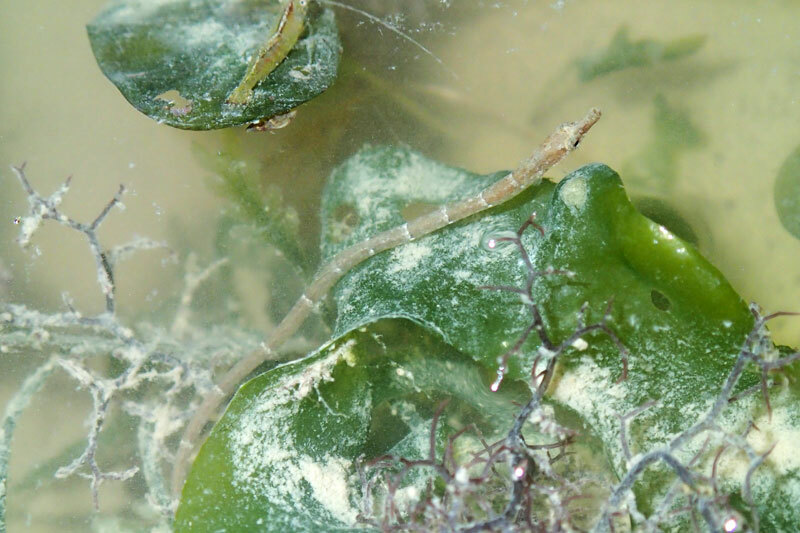 You can tell how small it is by comparing the pipefish with the size of the spoon seagrass (Halophila ovalis). 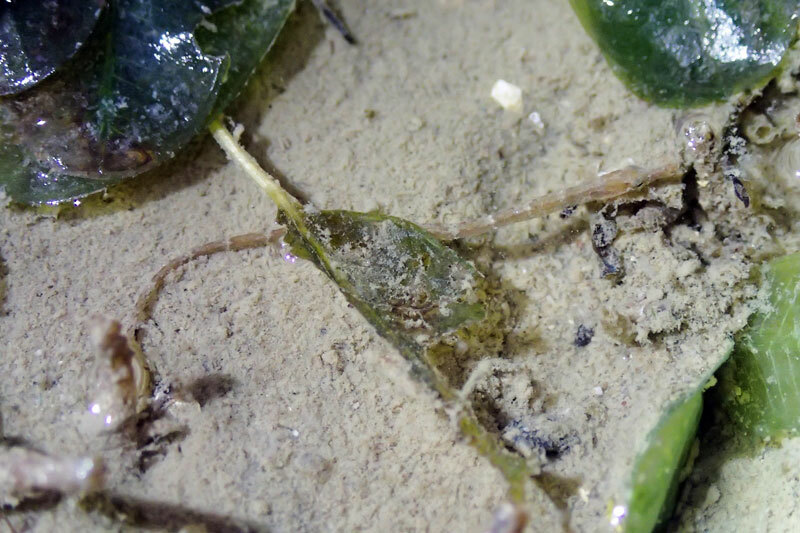 I came across another juvenile seagrass pipefish later. 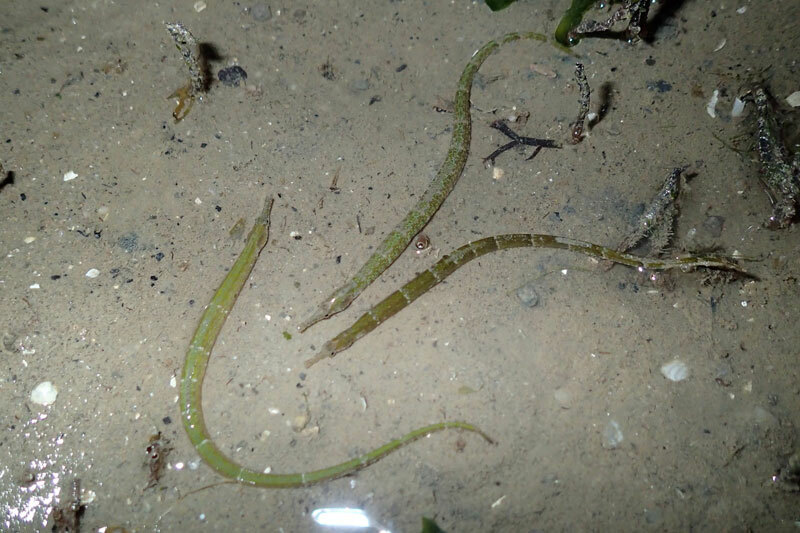 Of course the adult seagrass pipefish were around and there were plenty of them among the seagrass patch. 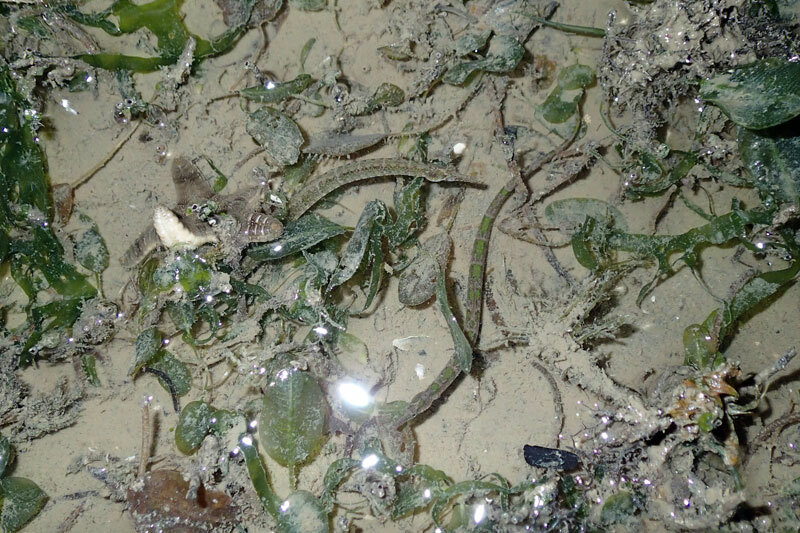 How many seargrass pipefish can you see? 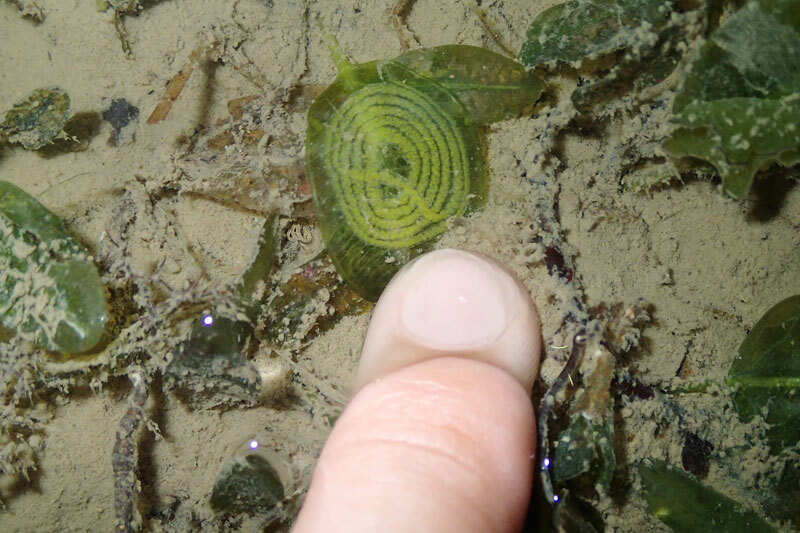 On the blades of spoon seagrass, there were coils of eggs. I wonder which animal they belong to. The area we started off has a good patch of seagrass and many animals can be seen if you take a closer look. 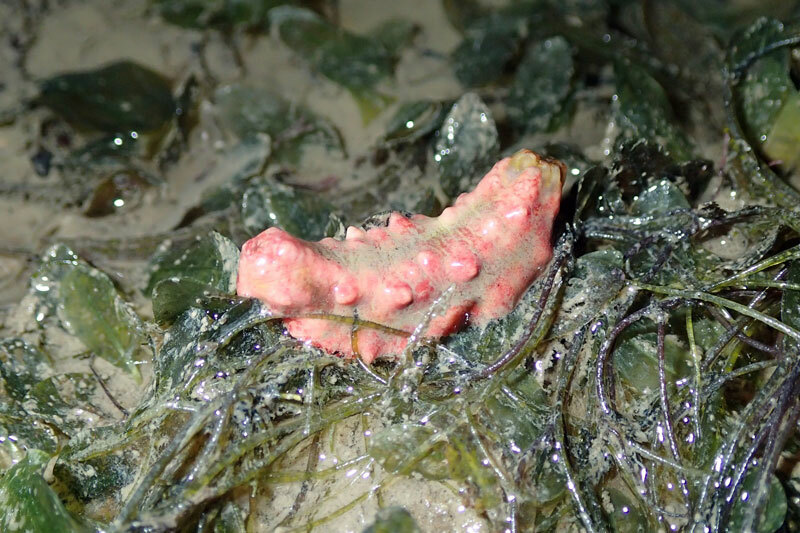 This pink blob-like thing is not a piece of plastic but it is actually a pink warty sea cucumber (Cercodemas anceps). 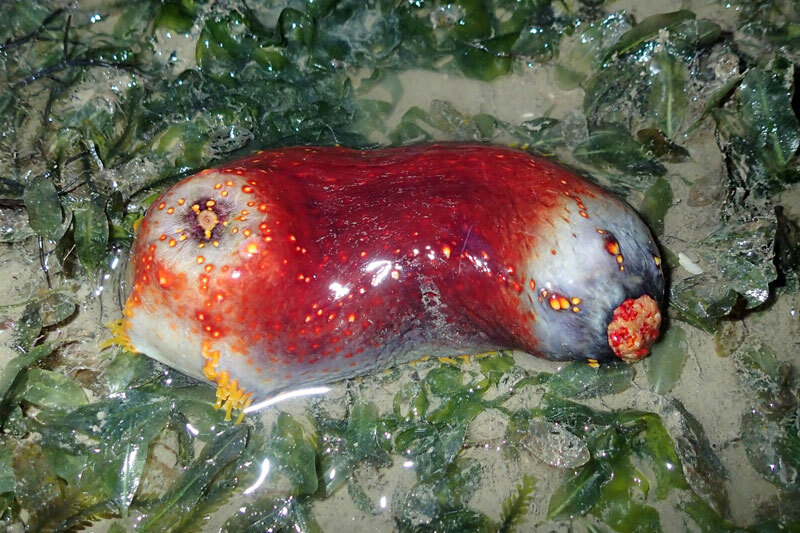 There are more sea cucumber to be seen on the shores of Changi Beach, such as the ball sea cucumber (Phyllophorus sp. 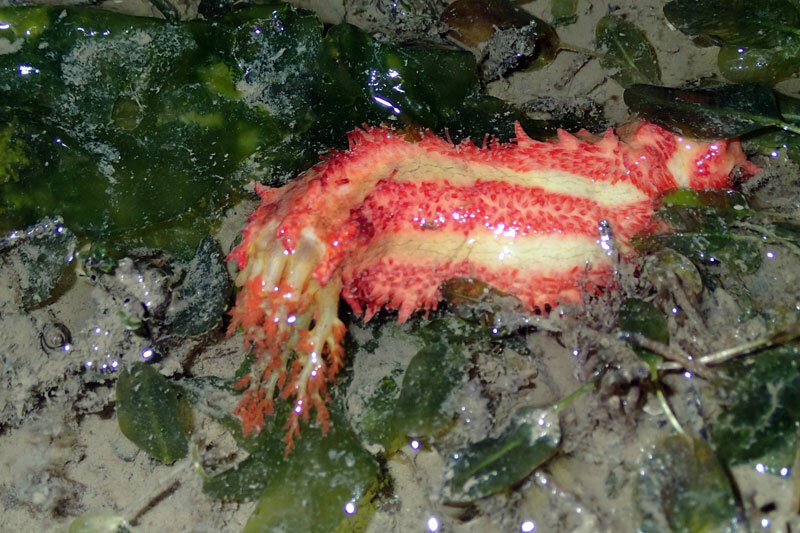 ), smooth sea cucumber and this thorny sea cucumber (Colochirus quadrangularis). However, the special sea cucumber find for this trip was spotted by Chay Hoon. It is the sea apple sea cucumber (Pseudocolochirus violaceus). 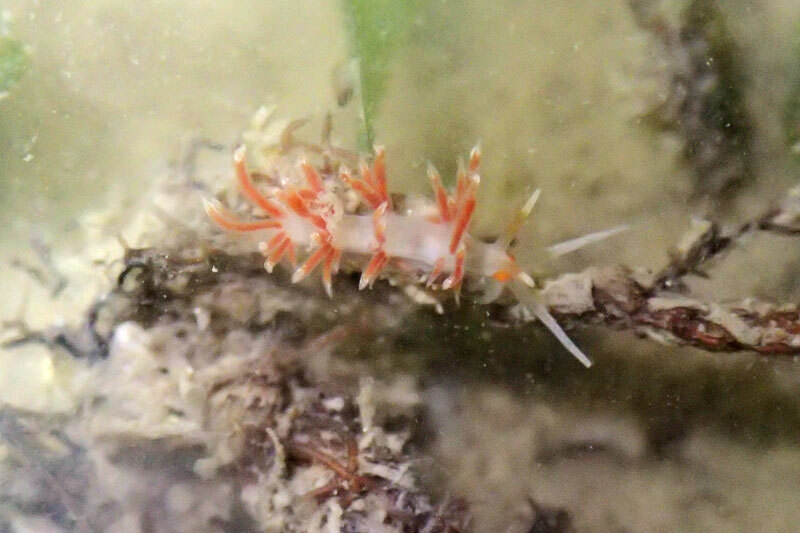 This is my first time seeing the sea apple sea cucumber. 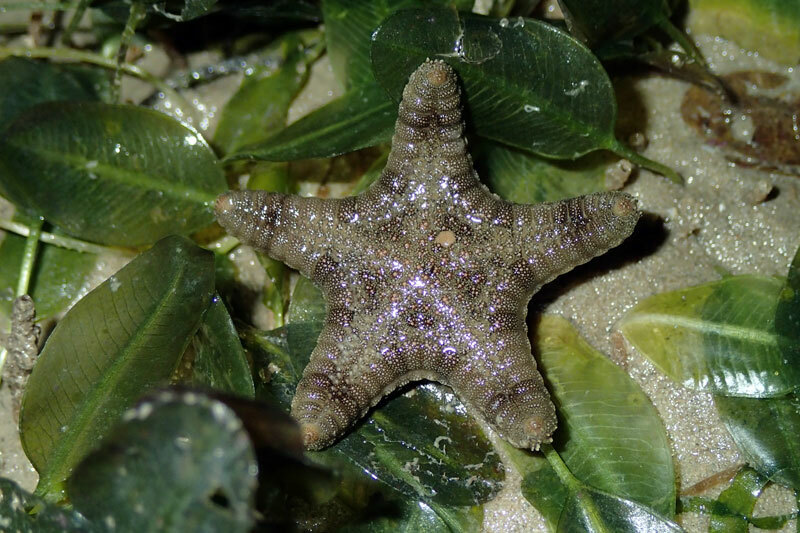 There were many juvenile biscuit sea stars (Goniodiscaster scaber) too! It is rather strange that out of 10 sea stars that I came across, 8 of them are turned over. 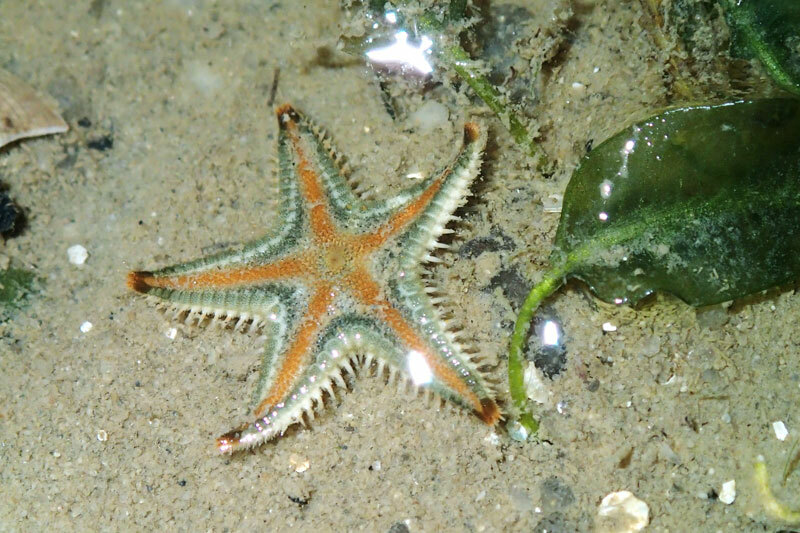 There was also a tiny juvenile plain sand star (Astropecten sp.). It was so tiny and cute! 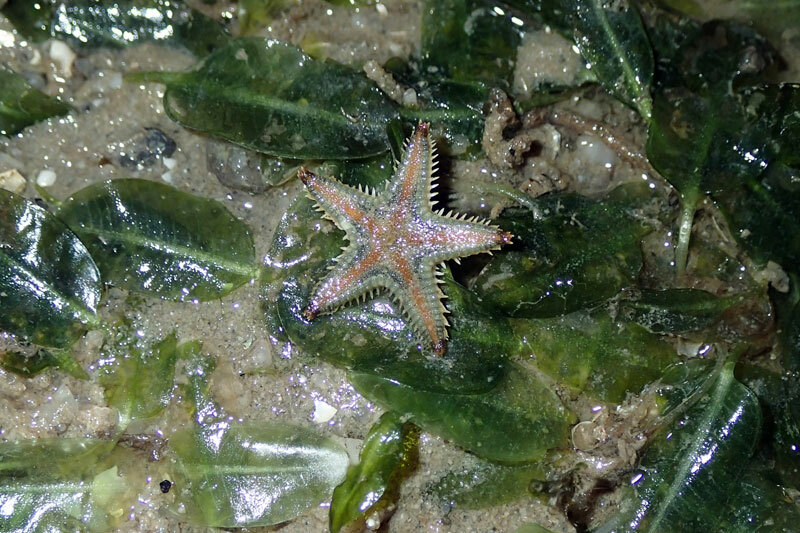 Tiny plain sand star, just slightly bigger than a spoon seagrass. Tiny plain sand star moving on the sand. This shore is a great place to find the orange-striped hermit crab (Clibanarius infraspinatus). 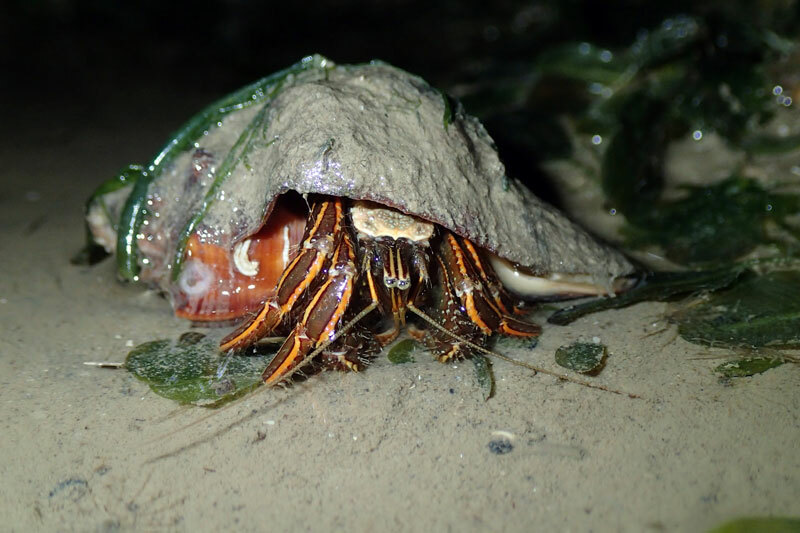 However, do not be fooled that every shell on the shore houses a hermit crab. Some shells are in fact the actual marine snail, such as this pearl conch or gong-gong (Strombus turturella) as we call it. I love looking at pearl conch and seeing their eyestalks looking out of its shell. Chay Hoon spots a tiny nudibranch. Only she can find such small animals. This poor snapping shrimp can out of its burrow in shallow pool and looks rather lost as it tries to figure the route back to its burrow. 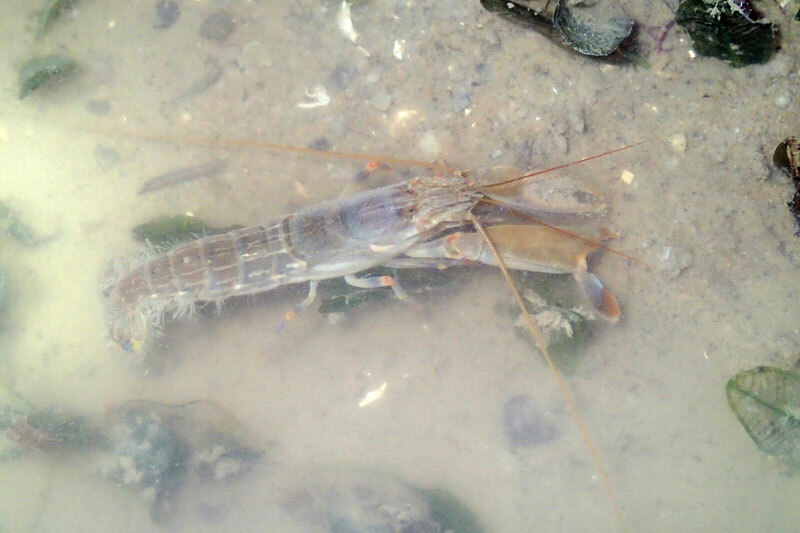 Snapping shrimp has poor vision and it will get lost if it wonders too far away from its burrow. 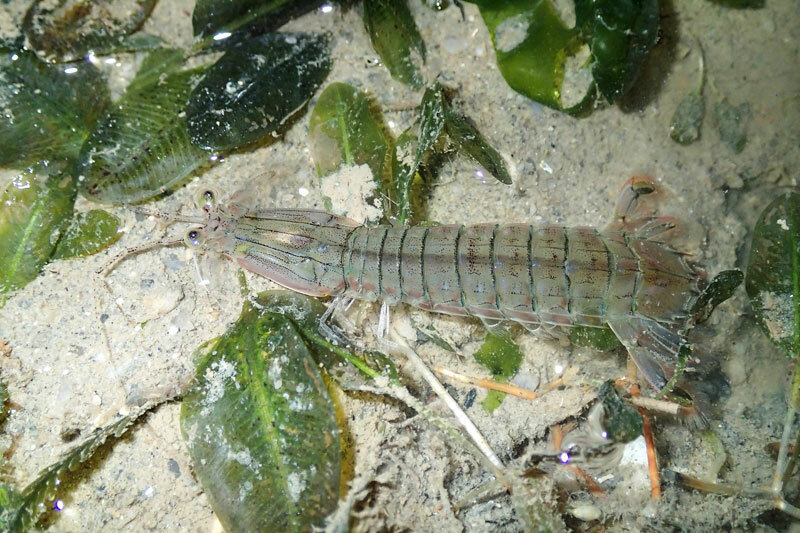 While checking out the sea apple sea cucumber, a spearer mantis shrimp (Harpiosquilla sp.) decided to check on me. The rest of the team came across a few big-head seagrass octopus on this trip. 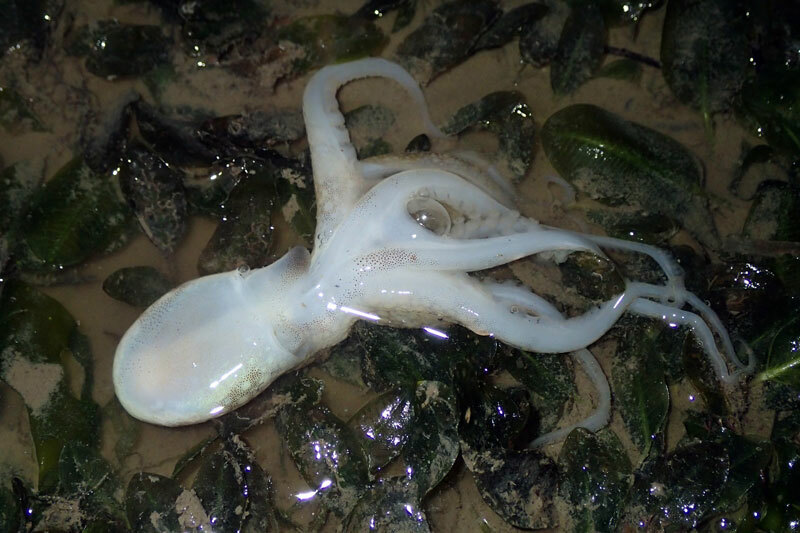 I too saw one octopus but it was acting rather strangely. 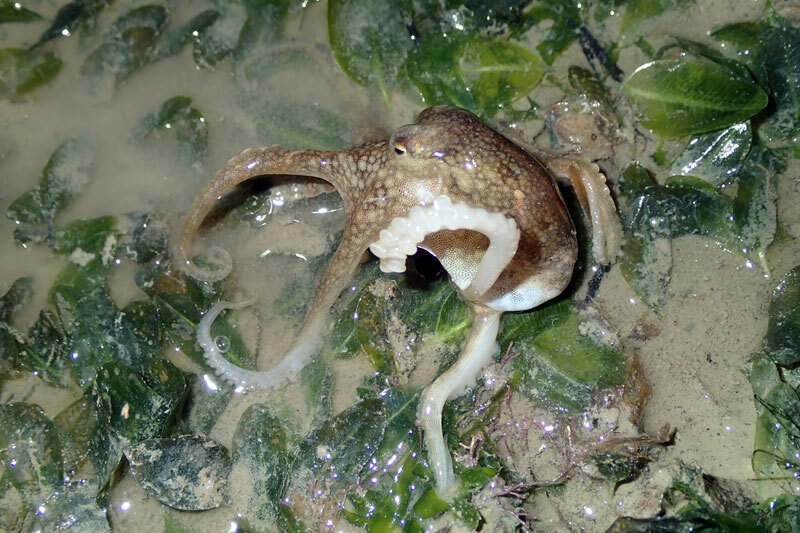 It "stood" up on its tentacles, lifted its head and flopped it on the seagrass bed. The strange behaviour took place twice and on the second time, it just laid on the seagrass patch motionless for quite sometime before "recovering". Here is a short video clip of how the octopus "recovered". The last best find on this trip would be a egg mass of octopus. 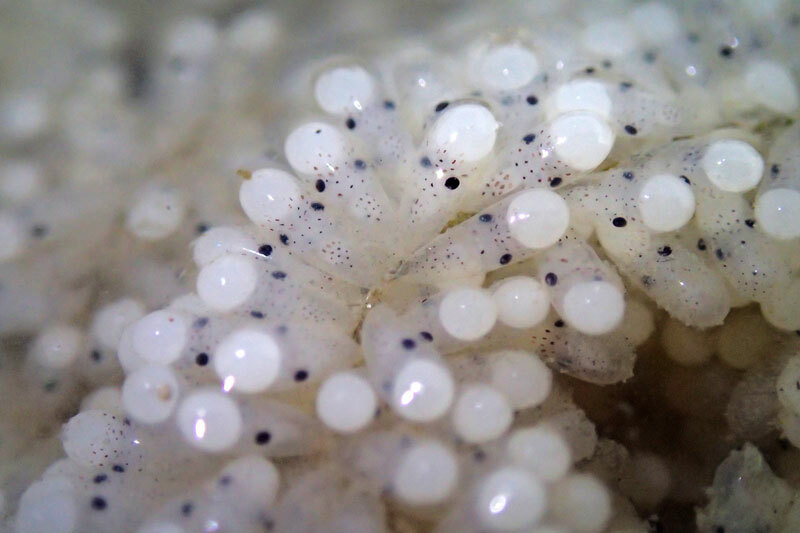 The eggs have tiny black dots, which are the eyes of the developing baby octopus. Through the camera, we can see that the developing baby octopus have started to develop chromatophores on their body. Octopus eggs, with developing octopus. Chromatophores are actually special units within cells that contain pigment and able to reflect light. The contraction and expansion of the chromatophores results in a change in colour, which changes the appearance of a squid or octopus. Unfortunately, the mama octopus is nowhere to be seen protecting the delicate egg mass. I hope the baby octopus will survive and hatch soon. For this trip, my photos are shot from my Olympus TG-1 waterproof compact camera.